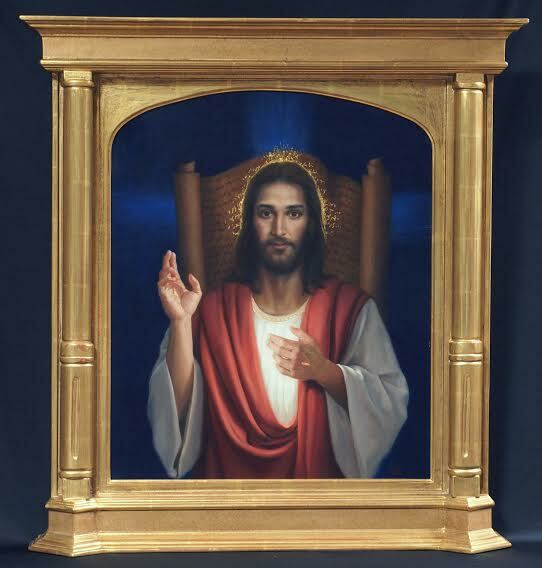 I received the following letter from artist Lisa Andrews, who wanted to show me a commission she had recently completed for Bishop Monforton in Steubenville, Ohio. Lisa’s website is lsandrews.com, and you can see more of her work there. The commission was simply “paint a portrait of Jesus.” They had seen my previous work at Franciscan University of Steubenville and other churches in the area. I chose the theme of “The Word Made Flesh,” showing Jesus as the embodiment of God’s Holy Word. Until His revelation in Christ, God’s Word was confined to Sacred Scripture, symbolized by the scroll behind him with writing in Aramaic. Just as He brought Light into the world, He “illuminated” the sacred texts, as shown in the gold leaf detail of the text immediately around his head, creating a halo effect. I chose to depict him in the traditional blessing pose, with his hands bearing the marks of the passion. I used gold leaf for the sacred wounds, symbolizing the glory manifest through his perfect obedience to the Father. The light emanating from his heart illuminates the cosmos, symbolized by the rays of light in a cross against the dark blue background. The chain design on the neckline of his robe is a reference to Gregory of Nazianzus’ image of the unity of the Trinity as similar to the links of a chain; as soon as one link is moved, all the links move.